It was an unusually busy weekend, all the more seeming so as I was a little under the weather and not in top form. Saturday started bright and early with the Copper Mountain Mesa Community Center First Saturday breakfast. Ken is the egg man so I drive him over at 6:00 a.m. and then I moseyed over around 7:30 a.m. I have to be there early to test the biscuits and gravy to make sure the gravy isn’t lumpy. Someone has to do it. The biscuits are always delicious as Mary Helen makes them and they wouldn’t dare be anything but delicious. I am the hostess so I set up the tickets, the sign in sheet and the cash drawer and welcome everyone in. I’ve been doing this for about six months now and guess I know about half the people. Annelies Kuiper, who serves, was home ill so poor Patrick, the other server, was run ragged. Kelly Gazley came to train to be the hostess at 9:00 and picked it all up so thoroughly and so fast that I was able to step away and serve breakfasts. I used to be a waitress and it was my all-time favorite job, but hard on my knees so I don’t do it anymore. Hosting/serving one Saturday a month is all I get now but I really love it and am happy to get the chance to dabble in it. 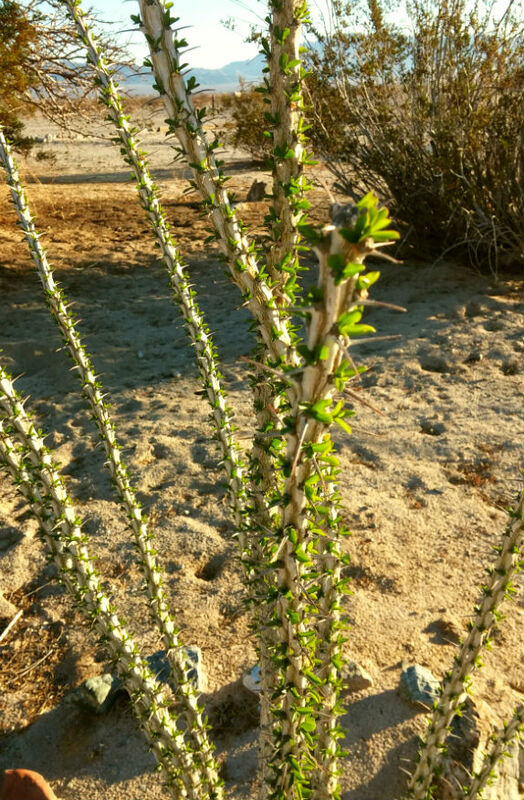 Recent rains brought new life to the Ocotillo. After breakfast we went back to the cabin where we’re working on a native garden. The trees we ordered arrived last week so we brought them up to plant – 4 sea buckthorns, olive and a Kashmir pomegranate, all basically non-native but desert-loving. We got the pomegranate in the ground and had to stop so we could make it to the opening at the Glass Outhouse Gallery. Once there we were happy to look at the art and then sit in the shade of a beautiful desert day, chat with Frank, and listen to the live music. Later we drove back to the cabin, had a little dinner on the patio and then fell into a deeply needed sleep. We drove to the Palms for breakfast. Such a simple sentence for a very complex recurring event. We meet our neighbors for breakfast at the Palms each Sunday and we hang out for several hours catching up, sharing a meal, and lately – singing. After that we dashed home to set up for an afternoon fundraiser for the artist Heather L. Johnson. She’s the author of In Search of the Frightening and Beautiful and is raising funds to begin her travels again, this time to South American, on a motorcycle. Everyone was eager to give and be part of, in some small way, her travels and her project. If you’d like to take part, come to the Palms on Saturday, February 21. GREAT musical lineup: The Sibleys, The Renderers, son of the velvet rat, the Reverend Screaming Fingers (aka Luci Lightning) and BATT. Heather will be selling art books and T-shirts and all the best people will be there (except you, if you can’t make it). After saying goodbye to our last guests we cleaned up and moved back to the cabin. Another early start. Kip came over shortly after 7:00 a.m. to carpool with us to the Marine Base for a tour with artists from High Desert Test Sites. 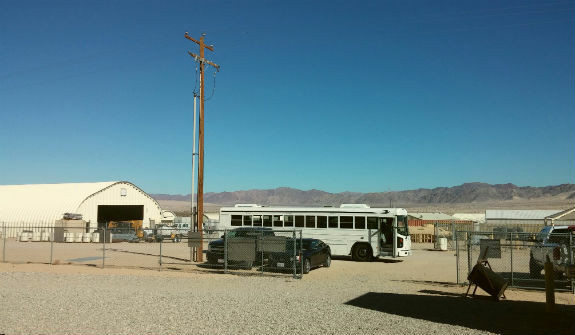 It was a six-hour tour and it was hot – in the high 80s. I have a fondness/fetish for military social life, having visited cousins on their bases in Europe and having once dated a major at the Presidio in San Francisco. There’s something restful about black and white thinking, something relaxing about certainty, especially when it’s hot out and the drinks are very cold. 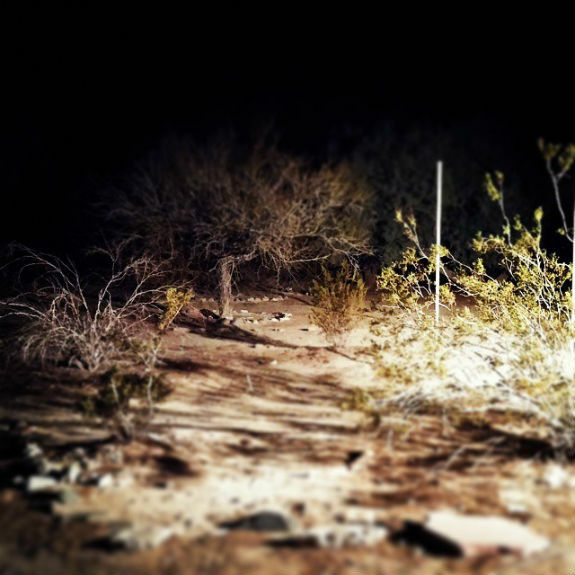 But certainty is an illusion, so while I enjoyed the stories and apocrypha they had mostly turned to sand by the time Ken and I arrived back at the cabin. 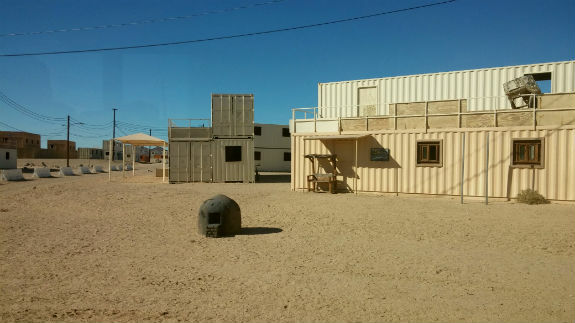 The Marine Base, the cleanest place in the desert. 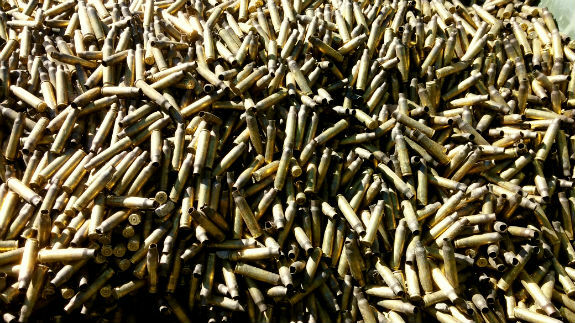 Spent shells at the Base recycling center. Good to know that this stuff isn't left in the desert. 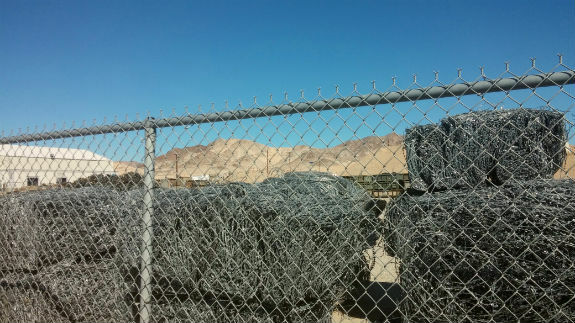 Bales of concertina wire ready to be recycled. The coup de grace for my Marine fantasies was the red and gold sign, in a series of signs honoring various Marine ventures along the main roadway in and out of the base, dedicated to the Banana Wars. I felt a sinking feeling in my heart as I recalled what I’d learned about the United Fruit Company and the writings of Marine Major General Smedley Butler. So while I enjoyed the tour, the tour guide, and learned a lot, it was not a lark. 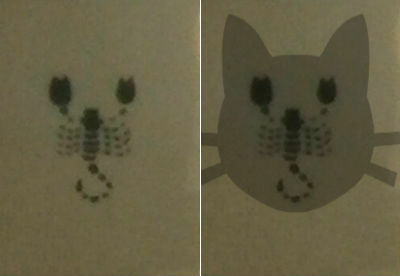 I saw was the face of a surprised, tulip-eyed kitty with lots of whiskers. Nice kitty! At the end of the six hours I was spent. But we still had trees to plant. Ken set me up on the porch in the shade and I constructed cages out of chicken wire to protect our new trees. By 6:00 p.m. we were finished, took a short nap, righted up the cabin and drove back to Los Angeles. I grew up on various VA Hospital stations. I recognize your "something comforting in black and white". It empowered me later to say BS to Vietnam, for black/white can also be a sharp knife on BS.